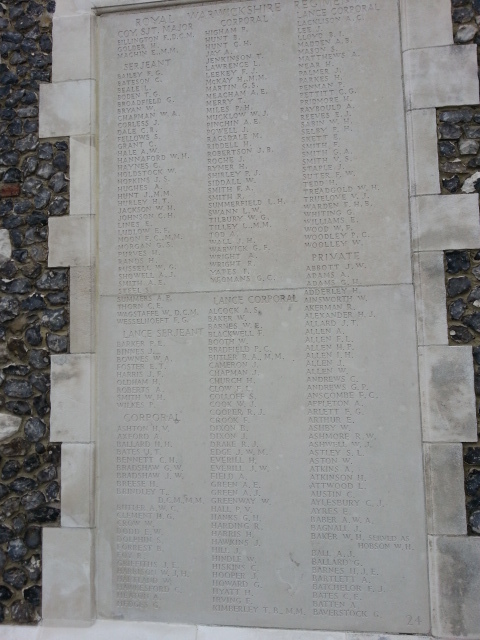 A substantial number of men from the Stockwell area were not listed on the Memorial. 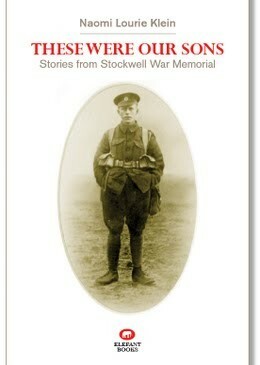 The Stockwell War Memorial committee invited families to submit names. 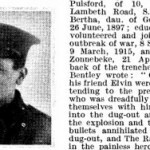 Some may not have wanted their sons’ names to appear on it; others may have moved away and not been aware that the opportunity existed; others still had resided outside the official boundary of a half-mile radius from the building. 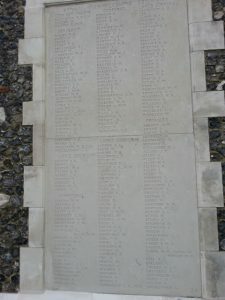 It is clear that some families came forward after the unveiling of the monument: a few names were added, out of alphabetical order, on the final panel. 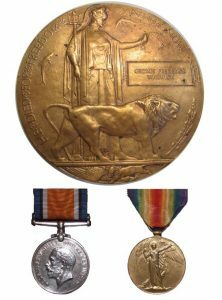 George Frederick Warwick is not listed on Stockwell War Memorial, despite the fact that his family home at 180 Stockwell Road was within half a mile of the memorial site. 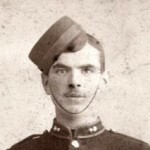 We do not know the reason for his omission. 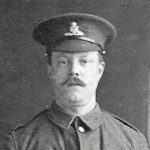 His name has not been discovered on any of the other local surviving memorials. 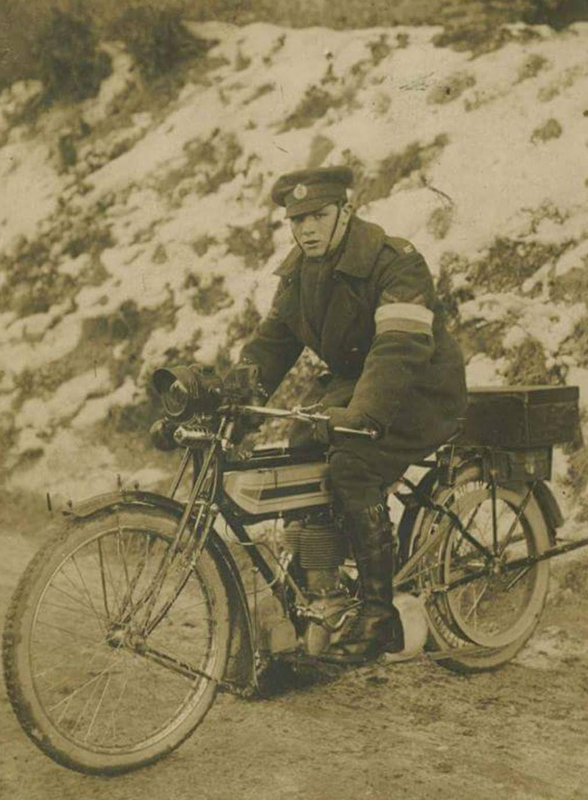 After he enlisted in the Royal Engineers in Lambeth in 1915, George served as a Dispatch Rider in various locations around Arras, in the region of Artois, northern France. 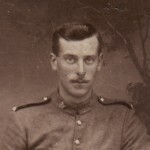 In March 1917 he was transferred to the 1st Battalion of the Royal Warwickshire Regiment and took part in the Battle of Arras (First and Third Battle of Scarpe), after which his regiment was kept on the front line to consolidate the system of trenches dug on the ground retaken during the battle. On 30 September George left for Ypres and was killed in action just over two weeks later at the Battle of Broodseinde, at 19 Meter Hill. 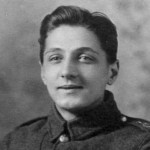 While he was serving he fell in love with a young French woman, Georgette Béthencourt, who gave birth to his daughter, Marie, on 26 August 1917. He was able to hold his child in his arms only twice before leaving for Ypres. 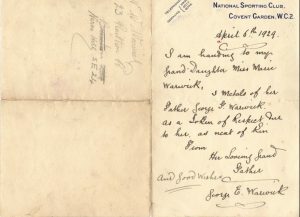 George, who was born in the parish of St Martin in the Fields, Westminster in 1896, was the eldest of seven children of George Edward Warwick, a Covent Garden master porter, and Julia Catherine Williams. 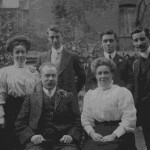 In the 1911 census the Warwick family was recorded as living at 180 Stockwell Road, with a female servant and a male boarder. 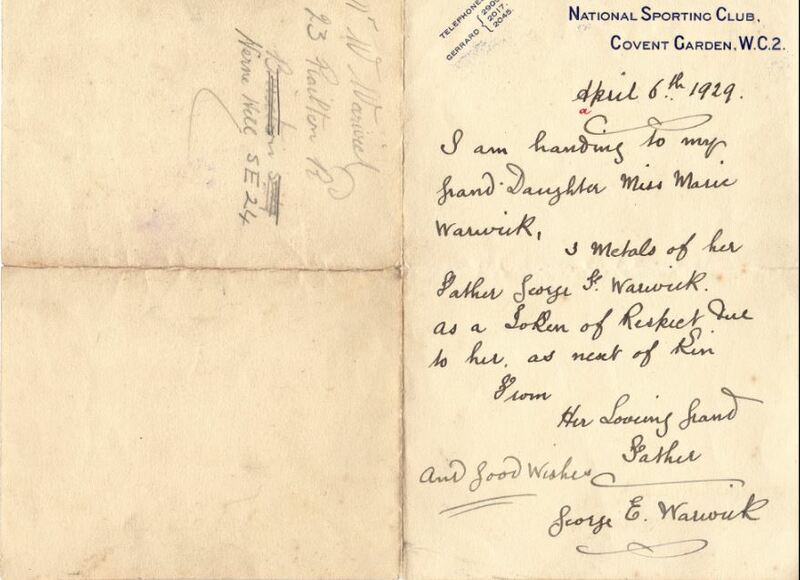 When George’s daughter was 11, her George Edward, her grandfather, sent her George’s medals (see letter below). 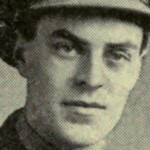 Information and all photos by kind permission of George’s grandson-in-law Pierre and Elisabeth Rouvillois.